The FIFA World Cup 2014 Brazil, starts on 12th June in Sao Paulo with the group stages, and ends 31 days later, with the final in the mythical Maracana, in Rio de Janerio, on 13th July. This world cup has a total of 32 countries, in 8 groups, competing for the trophy. I present to you a handpicked list of the best accessories for enjoying this world cup, living it, breathing it. Here are some cool ways to show your support, wear your national colors, enjoy and celebrate with friends and family - the greatest show on earth, which is the world cup. 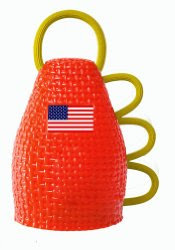 The caxirola, replaces the vuvuzela as this 2014 World Cup's official noisemaker. Caxirola is a Brazilian percussion instrument, that you shake. Whether you enjoy this world cup with friends in a sports bar, pub, your den, or your living room, bring along and shake your caxirola in support of the 2014 FIFA World Cup. Available in different country editions including USA, Brazil, Argentina, Germany, and Spain. Get into the fervor, frenzied passion, and spirit - of football, soccer, Brazil, the game, the fans, the World Cup 2014 - with the official 2014 FIFA World Cup Album. Includes "We Are One (Ole Ola) by Pitbull feat. Jennifer Lopez & Claudia Leitte" - the official 2014 FIFA World Cup song; "Dar um Jeito (We Will Find a Way) by Santana & Wyclef feat. Avicii & Alexandre Pires" - the official 2014 FIFA World Cup anthem; and "Tatu Bom de Bola by Arlindo Cruz" - the official 2014 FIFA World Cup mascot song. Once every four years, adidas creates a ball worthy of the world champions. This is adidas’ Brazuca, the official ball for the 2014 FIFA World Cup Brazil. Designed for never-before-seen power, swerve and control - the Brazuca is a premium match ball with high-end materials in the cover, backing and bladder to ensure perfect on-field performance. It uses a groundbreaking six-panel design, which improves symmetry, uniformity and efficiency. Named Brazuca back in September 2012 following a public vote in Brazil, "Brazuca" is an informal local term which means "Brazilian", or representing the Brazilian way of life. 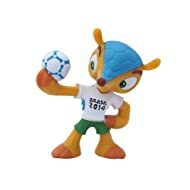 Fuleco, the official mascot of the 2014 FIFA World Cup Brazil, is a colourful armadillo. Why an armadillo as a mascot? Because armadillo is an endangered species, is 100% Brazilian, and it turns into a ball. The name "Fuleco" is a portmanteau of the words "Futebol" ("Football") and "Ecologia" ("Ecology"). Immerse yourself in the 2014 FIFA World Cup Brazil, with this wall chart poster. A must have for your home as it features the complete list of team groups & fixtures so that you can plot the tournament all the way to the final. So from June 12th track your chosen team from the group stages to the knock-out stages, from the quarter-finals through to the semi-finals and then onto the heart stopping final match on 13th July. Whoever you are cheering on, invest in this brilliant piece of memorabilia and record the events of the 2014 World Cup. Show your national pride, show support for your favorite team, throughout the world cup tournament in these authentic replica of the home team kit. Wear the colors, as your national team sets the pitch on fire with its version of the beautiful game. Featured above are the official 2014 FIFA World Cup soccer jerseys of USA, Spain, Germany, Brazil, Argentina, and Mexico (in the order of appearance). These are the official FIFA books and guides to the world's biggest, most popular sports event. Packed with photos, these offer expert analysis of each team, its star players, and its prospects in the finals, along with information on the stadiums and host cities. Great companions for fans, and soccer-crazy kids, to follow the progress of teams as the games advance. The Official 2014 FIFA World Cup Brazil Activity Book. Have a whale of a time enjoying the world cup with friends and family, wear your colors with this cool afro wig. Show your support for team USA. Also available in the colors of Brazil, Portugal, France, Italy, Argentina, and Ireland. Get ready to support your national team, your favorite players. Wish you a great world cup experience, and 31 days of awesomeness! Go ahead, make use of this collection. Share this list with friends and family.